Morning drive from either Entebbe town or Kampala City depending on where you spent the previous and drive to Mabira Forest, east of Kampala. 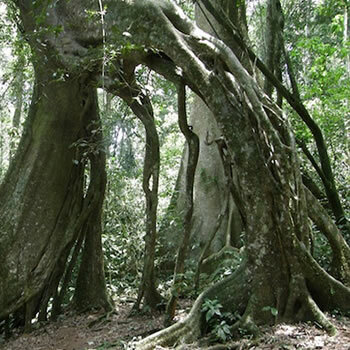 Mabira Forest is the biggest rain forest in Central Uganda with a considerable amount of biological diversity which include, mammals like Red-tailed monkeys, Grey-cheeked mangabeys, birds like Great blue turacos , Black and White casqued hornbills, rare birds like Nahan’s Francolins, Cassin’s Hawk Eagle, Purple-throated cuckoo shrike, trees, butterflies and many others can be seen. Ecotourism activities carried out in this jungle are nature forest walks, sky way/ziplines, mountain biking, specialty bird watching, camping and accommodation. After a day’s involvement of selected activities of the beautiful forest, you are led to spend an overnight at Griffin Falls accommodation facility. After a delicious forest breakfast a drive is made to the source of the longest river Nile in the world, a boat ride is taken to the point where one of the earliest explorers in Uganda - John Speke named the source of the Nile. On the boat course you are to see the numerous water birds like Cormorants, Pelicans, Storks, King fishers among others. Itanda Falls is located several kilometers from the source of the river. The Falls are one of the spectacular falls of a “must visit” on this two day visit to Uganda because it has not fallen victim of the development of Hydro electrical power. White water rafting can be an alternative to a visit to Itanda Falls. After this rewarding visit a drive is made back to Kampala city or Entebbe.